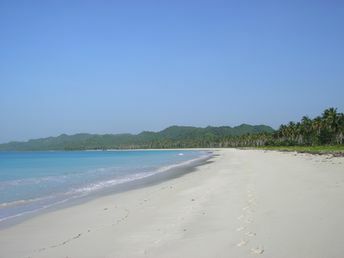 This beach ranks #4 of the "Best beaches in Dominican Republic"
There are no hotels on the beach. Las Galeras is the nearest town with hotels. Fly to Santo Domingo airport or to Puerto Plata airport. Get by bus to Samana town, and next by gua-gua shuttle bus to Las Galeras. Next go to pier and take a boat. Usually boats with tourists go to Rincon beach in the morning and return to Las Galeras in the afternoon. We strongly recommend not to walk to Rincon beach along the shore, as most of it consists of cliffs. If there's no boat, you can take a taxi.